‘White is right’ and why not? Everyone wants a dazzling white smile and there are ways to get that extra sparkle in your smile. 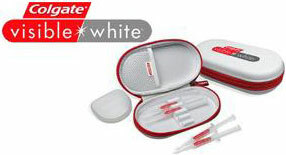 At Home bleaching is a safe, reliable and effective method to whiten teeth. Syringes containing 10% carbamide peroxide gel are applied into custom-made clear bleaching trays. The trays and the bleaching gel if worn overnight; within 7-10 nights of the treatment you will see visibly whiter teeth. Further 10% carbamide peroxide has been approved by the FDA (Food Drug Association) and ADA (American Dental Association) to be safe, reliable and effective. In Office bleaching can be completed within one hour. During the â€œIn Officeâ€ bleaching, a tooth whitening gel is applied to the teeth. Rated by REALITY the bible for dental products as the # 1 in office whitening System! Opalescence Boost features a unique, chemically activated formula that allows your dentist to whiten your teeth without the bothersome heat or ultraviolet rays of a light. Opalescence Boost also contains potassium nitrate and fluoride, which help to improve oral health by strengthening enamel, decreasing sensitivity, and offering increased cavity prevention.